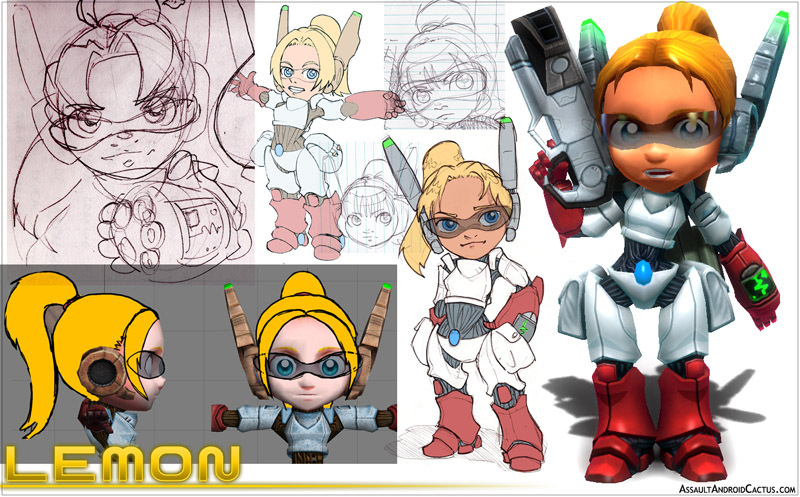 The characters are important in Assault Android Cactus, choosing who to play as will be a lot like choosing your ship in a top down shooter, as their primary and secondary weapons will make each character suited to different tactics. I also wanted them to have some personality to make them memorable, but not so unique that it'd blow out the scope of the game. Additional characters are unlocked throughout the game, but you start with four. 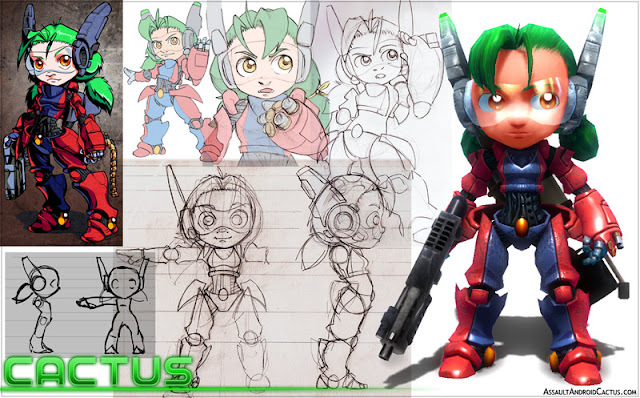 First up is our heroine Cactus! 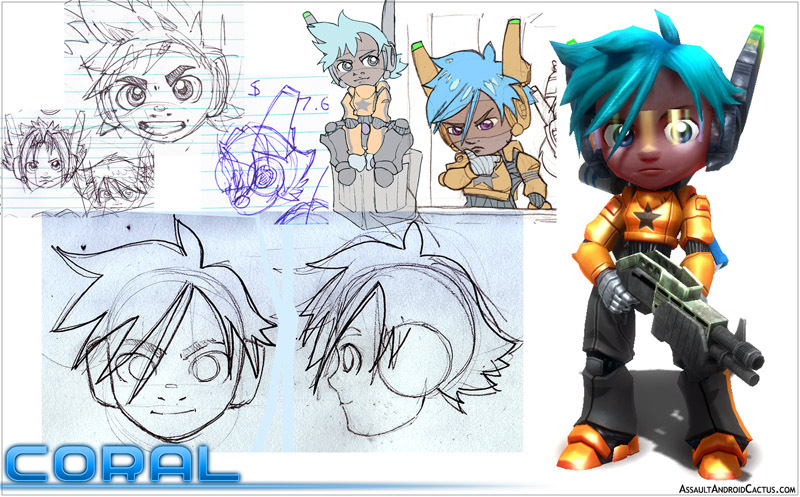 She's got a bit of a history, I was first drawing her back in 2003, meaning she pre-dates the game by a large margin. That's a picture of her from 2007 on the upper left. On the lower left, there's a front and side sketch of the first prototype character. This was to test out the proportions and make sure her actions would be readable in game. This was when I made decisions like putting health lights on the top of her 'ears'. 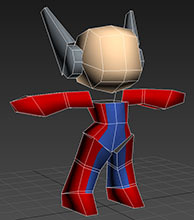 In the middle you can see the front and side I worked off to model the final character. Her limbs got a little longer but I was trying to keep the overall vibe. As the baseline character, her weapons are probably the most standard - the Assault Rifle emits a Vulcan cannon style stream of bullets, and the Flamethrower is short range but with a really high damage output. 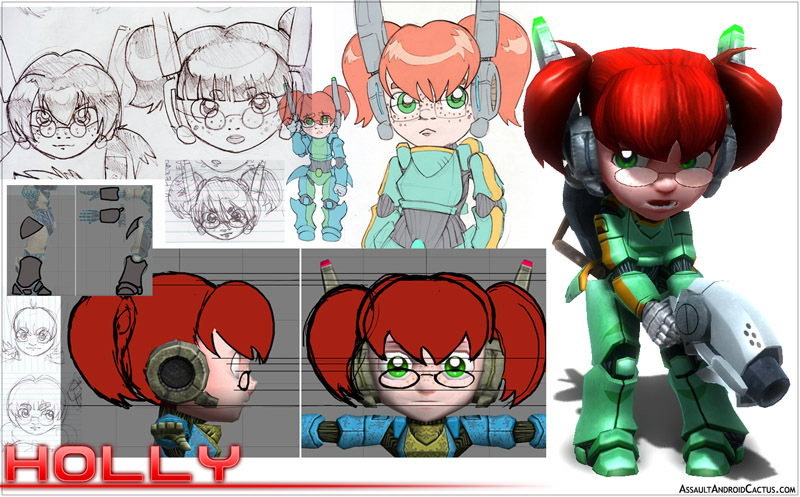 Holly was the first character designed specifically for the game. She is an inventory manager aboard the Genki Star, and has a combat capable body because she works in dangerous conditions, not because she expects to see combat. She will do what needs to be done, but finds it all very stressful. Holly is an alteration of Cactus, but while Cactus has a wing motif on her calves, a gun for an arm and a 'junkyard' style abdomen made up of non symmetrical details, I wanted the other androids to look more 'stock' in comparison. On the left you can see some simple paint overs I did for the legs and arms to give them a more standard look. For gameplay, the most important thing was to make the hair easily readable - it's the most visible part of the character, and as well as being a different colour I wanted to use a different shape. I played around with various pigtail designs, but I eventually settled on large pigtails set high on the head. You can see in the paintover that I originally planned to have them sit behind her 'ears', but when I started modelling them I realised they would make more sense if they hung forwards. She fields a Seeker gun, which shoots auto homing projectiles, and the Cannonball, which fires a single slow moving projectile that can take out multiple enemies in a line. This gives her an interesting mix between being beginner friendly, but taking a lot of skill to get the most out of her. Lemon is a medic in training with a sunny disposition. Like Holly, her body is mostly 'stock', but like Cactus she has a fused left arm, in her case a medical display. She also has satchels in place of floating side fins. The lights on the ears are controlled with a tinted emissive texture, which meant it was easy to add the ECG readout to it, meaning it'll change colour when she loses health and turn off when she gets knocked down. She uses the crowd favourite Spreadshot gun, backed up by the four shot Rocket Launcher, giving her the ability to crowd control effectively then put damage exactly where she needs it. The fourth character is Coral, who is active and outgoing, and had a part time job aboard the ship as a fitness coach. I knew I wanted her hair to poke out in all directions, but went through a few variations before settling on something I thought felt right. The sketch at the bottom is the front and side I modelled the geometry with. Body wise, she lacks side fins all together, has a colour scheme modelled after sportswear and her visor is straight up and practical. She uses the Shotgun and the Plasma Ball, which are both short range weapons. However the Plasma Ball will drop in place, damaging and pushing away any enemies that are near it, meaning she can use it as a temporary safe haven, a way to soften enemies while hitting them with the shotgun, or even to block off choke points, making it an extremely versatile weapon combination.